If you’re passing through South East Queensland and looking for an easy, fun island getaway, then Stradbroke Island is a great choice! 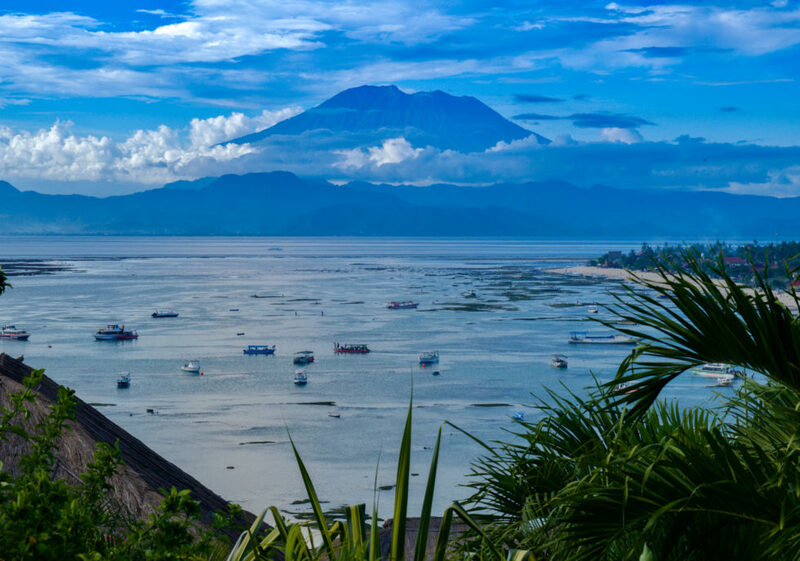 It offers travellers a variety of beaches, scenic walks, a few 4wd tracks to explore, ocean activities, marine experiences and shops, restaurants, bars to waste time and money in. You could drive off the ferry and settle in at a beach campsite for a week, or pack a weekend bag for the ideal two night hotel escape! The 45 minute Stradbroke Island Ferry trip from Cleveland to the island is the start to your getaway and the ONLY way to get your vehicle across. Cleveland is approximately an hours drive South from Brisbane City and 90 minutes from the Gold Coast. We paid $166 for a return trip to get our Nissan Patrol (and Rooftop Tent) across which we thought was good value. 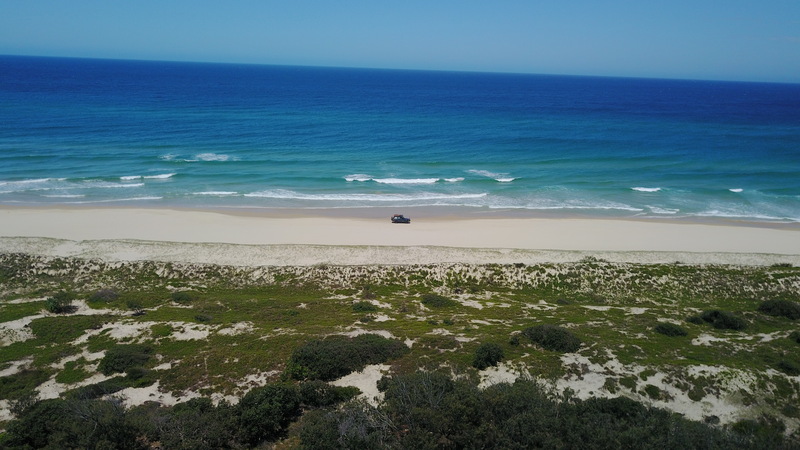 If you plan to explore anywhere off the sealed roads and drive along Main Beach, Flinders Beach and through the Minjerribah Recreation Area, you’ll need a 4WD Vehicle Access Pass which currently costs, $45.25 for the annual permit. Passes can be purchased online or when you buy your ferry ticket at the office in Cleveland. Tip – If you’re thinking of ‘island hopping’ from Straddie to Moreton, there is NO LONGER a ferry between the two islands. No matter what people tell you, it ceased operating a while back – trust us! Accommodation options are abundant on Straddie as are great campsites but if you’re like us and don’t enjoy being squeezed in next to others at caravan parks or grounds, AVOID visiting during the busy school and public holiday periods! Main Beach on the East Coast is the perfect destination to set-up and unwind. 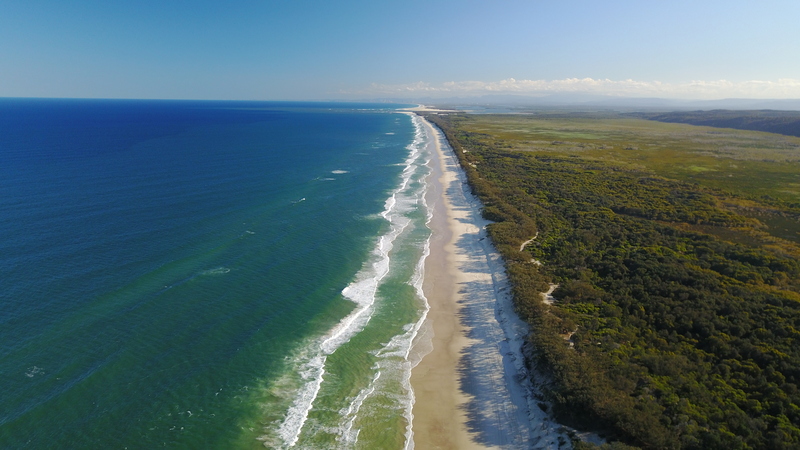 The sites are spacious and secluded, set high up on the sand dunes and offer views North to Point Lookout and South to the glittering lights of the Gold Coast. When the surf is pumping, and the fish are biting, you could stay here for weeks and settle into #islandlife! We paid $16.95 per night for the two of us at Main Beach and $18.85 per night at the Flinders Beach camp site. If you plan to stay at the campgrounds/parks, then you’ll be paying more. Flinders Beach (at the Northern end of the island) offers good protection if the winds are blowing and you need to escape. The sites are spacious, set amongst the trees and ideal for large groups and…. 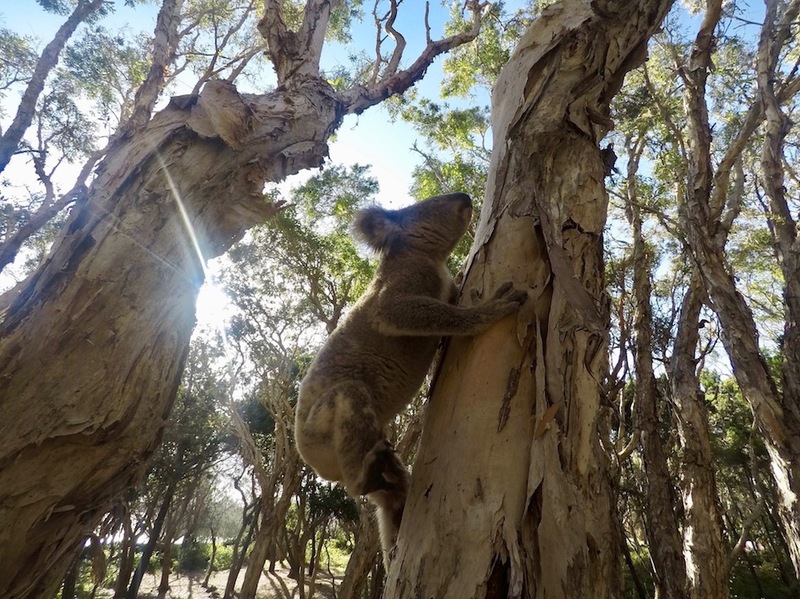 koala spotting! We were kicking back enjoying our morning coffee and were joined by a cute koala who scurried up the paperbark tree next to us. Welcome to Australia! 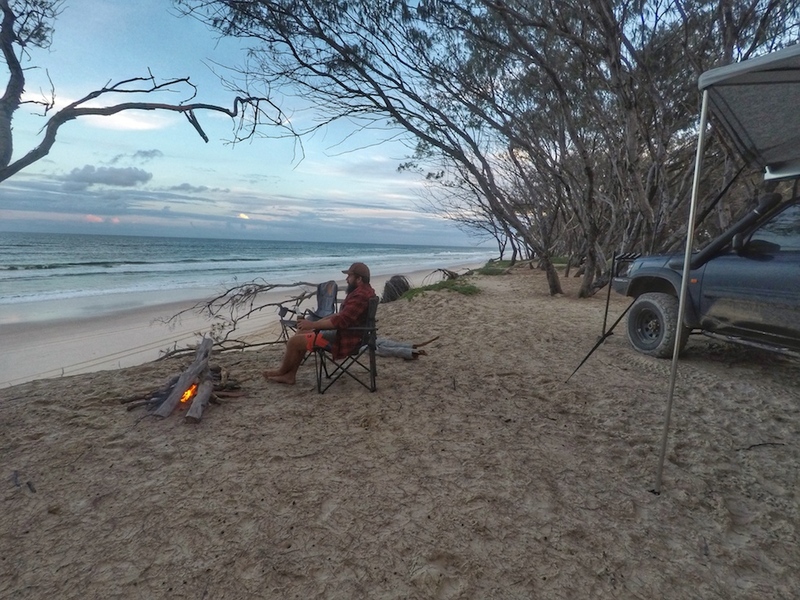 Tip – You’ll need a 4WD vehicle to access both beaches and campsites! 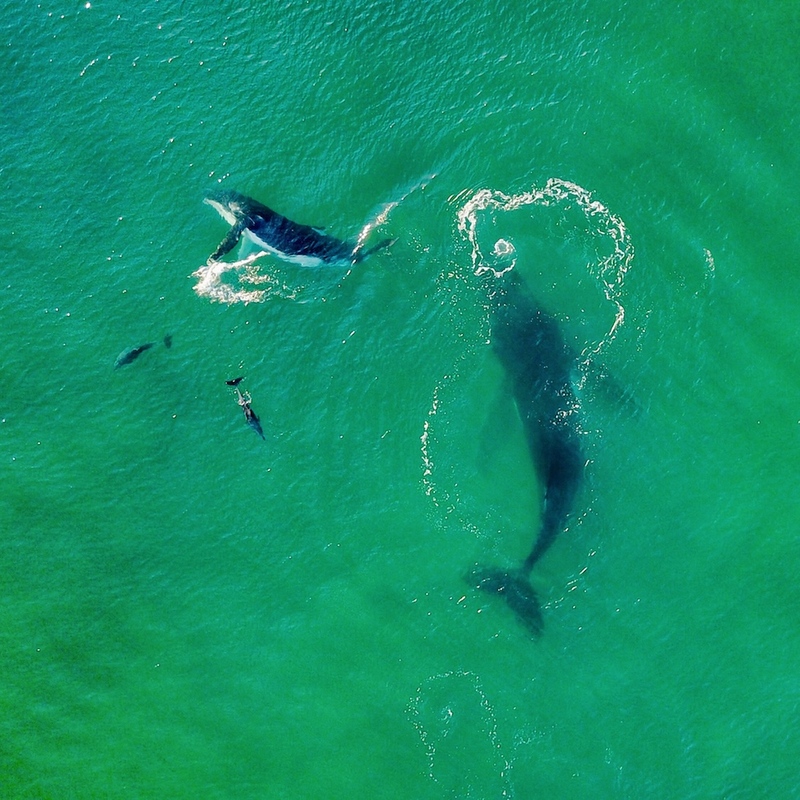 If you visit Stradbroke Island between June and November, you’ll receive better value for your ferry dollar as the humpback whales are on their annual migration. During our October visit, while camping on top of the Main Beach sand dunes, we saw over 30 whales frolicking in the waters and some as close to 100m offshore. There are Dolphins galore competing with the surfers to ride the waves and Dugongs, Turtles and Manta Rays can also be found in the waters of Moreton Bay and the Coral Sea close to the island. The Straddie locals told us that “Manta Ray Bommie is one of the best spots to dive with Manta Rays in Queensland” so lock in a tour and go experience greatness! 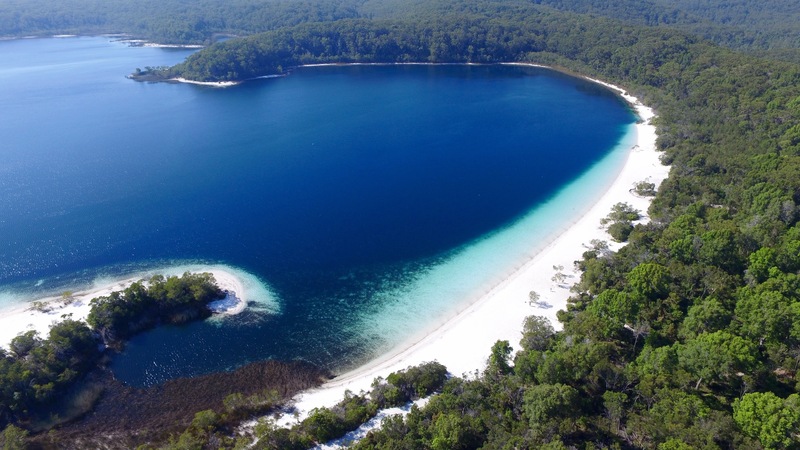 This was our first trip across to explore the world’s second largest sand island (Fraser Island is the largest) and to be honest; our expectations were high after so many memorable trips on Fraser. Thankfully, the longer we stayed on Stradbroke, the more it made an impression on us and we grew to appreciate the unique differences between the two islands. Off-road enthusiasts who like to explore trails and tracks won’t get too many thrills from Straddie. The limited inland tracks are easy to drive, offer scenic views and are worth taking half a day out from your beach time to tour around. Get your tyre pressure right and you’ll have fun exploring! Outside of not having to worry about dingoes, one of the best differences we appreciated about Stradbroke Island is that campfires are still permitted, unlike Fraser Island where fires are only permitted in 1-2 camp spots. Make sure you bring your firewood when you’re coming across to camp on Straddie as National Parks don’t allow you to use any wood from the island – fair enough! Our four day getaway to Stradbroke Island was the perfect mix of chilled out camp time, marine and wildlife experiences. 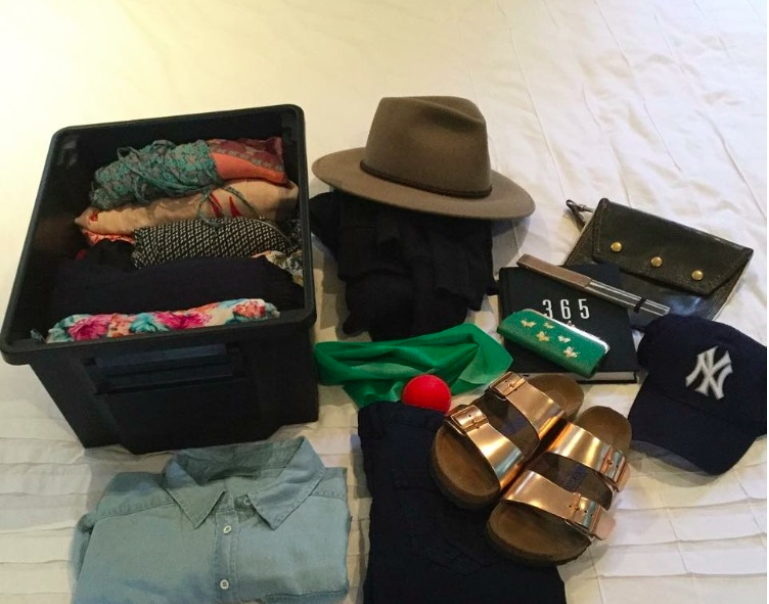 Our mission was to ‘unwind’ during our sandy escape and we achieved that! When we’re after adventure we’ll stick with Fraser Island but we’ll certainly return to visit Straddie one day. We can see why it’s the ‘go-to’ island pick for families in need of an island camping trip as it certainly is an easy, fun and affordable option!